Louis Malle is very clear that Murmur of the Heart is only partially autobiographical. But he’s also clear that the — ahem — climax of the film felt like the only logical conclusion to the relationship he was building between his main characters, including the character who is supposed to be him as a young teen. It’s…uh….complicated. Pat and I had issues with Murmur, but those issues are immediately overcome as we move through the rest of the Malle boxset Criterion has presented us with. Rarely have we gone from disliking a director so much to loving them so quickly. But for now, there’s this. We talk about the a movie that is clearly not for us with Louis Malle’s Murmur of the Heart. Listen via iTunes or LostInCriterion.com, and while you're at it, like us on Facebook or support us on Patreon. Let me once again tell you about how I purchased record albums this past year. As with years past, I sat down with every record I bought this year and listened through, then largely ignored any new discoveries to rank them based on how often I’d listened to them since purchasing. It’s time for an arbitrary list! I find it hard to relate to modern Christian music. I want to believe that people are sincere, but there’s just so much money involved, and so little art. Maybe I’m being too harsh. Generally the Christian music -- or Christian-adjacent music -- I like involves struggle. In that regard, there is something inherently appealing to me about mid-century gospel music, the sort of albums you find in thrift stores and “weird album covers” lists. Speaking of kitschy throwback. In lieu of saying anything that would fall short of properly praising this seminal album I’m going to tell you about the first time I consciously heard the first track, Planet Claire. I was in 8th or 9th grade and my friend Jonathan’s dad picked us up from some school function and started this album just as we got into the car. Now I’m certain I had heard Love Shack before then, but if I’d ever heard any other B-52s song I can’t say, and Planet Claire is no Love Shack, which I mean in the best ways. It was dark, I was quite probably sitting in a fold out seat in the back of the cab of a tiny pickup truck, and I was engulfed in what I was hearing. There’s a very good chance they’d dropped me off before the tape got to Rock Lobster, which there’s a small chance I may have recognized. Instead, when I asked what I was hearing, Jonathan’s dad told me they were called “The Planet Claire People” and while I don’t think I believed that, I’m certain that I didn’t know the actually answer for years. Thanks, Jeff Hape! You lovable weirdo! Has there ever been a band as densely clever as TMBG? And have they themselves ever released an album as densely clever as Lincoln? I mean, like besides most of their other albums? It seems this was my year to buy reissues of albums I wished I could have gotten lucky enough to stumble across in a thrift store, or at least a used record shop. Thanks, resurgence of the vinyl industry! Apparently this album was recorded for under $500 and using an “American Idol” branded toy microphone and I cannot believe that. Just utterly brilliant throwback soul music. Formerly known as HOMME, the Chicago multi-instrumentalist duo of Macie Stewart and Sima Cunningham formed in 2004 and has since toured with Jeff Tweedy and played with Chance the Rapper. I was lucky enough to catch them playing a small bar in Columbus when my friends in Room and Board opened for them. The full-length follow-up Parts (2018) is already my first purchase of 2019, so please look forward to hearing me write about that in a year. There was a time when Listener were two guys and washing machine -- and indeed a time before that with a different format as well -- and I’d be lying if I said I didn’t miss that. Now listener is a band with three people and no appliances, but still some of the most literary lyrics about regret and hope around. Each track on Being Empty: Being Filled is inspired by a different inventor/creator, some more in dedication to, some exploring motivations, and some lamenting. While the lamentful “There’s Money in the Walls” deals with Diesel’s unfulfilled dreams -- “When you don't go on, your song lives on” -- it’s the double whammy of the final two songs that pushes this record beyond, with tales of best intentions getting away from their inventors, either through hubris (the Oppenheimer inspired Manhattan Projects above) or oppression (Plague Doctor, about the inventors of Kevlar and gas masks, both invented for purely civilian purposes). For a very long time after I first encountered the video for Frontier Psychiatrist, I labored under the impression that it was illegal to sell this album in the US because of the copyright issues putting out an album that is almost entirely layered samples. Expertly layered samples. It’s among the best sample-based musical ventures to ever be produced. I’m pretty sure I was wrong about the legality since there was a 2001 US CD release, but last year it finally made it to vinyl here and I picked it up at one of the best record shops in the country, Vertigo in Grand Rapids, MI. I think I’ve been clear in the past that I’m easily swayed by certain strains of nostalgia, but let’s be clear, The Aquabats weren’t just my favorite band in high school, they’re my favorite band now, too. I saw them for the dozenth or so time earlier this year with my longtime best friend Jonathan Hape and I can only imagine the dumb smile I had on my face the entire night. Favorite band, favorite album, new vinyl release that sounds just phenomenal. Yeah it’s a favorite for the year. Gonna have to be a pretty danged good album to beat out the joyous nostalgia kick of this one. Good thing two did. Ok, technically two releases but they have the same title and came out at the same time, so whatever. mewithoutYou has long been a source of inspiration for me, and I’m always joyful for new music from them. While lyricist and lead singer Aaron Weiss and I have followed rather different (though not too different) religious paths, his acknowledgement that such a journey is useless if you don’t keep moving is deeply affecting -- always be trying to bring your ideals in line with your actions, and always be reaching for greater ideals. In that way the band is also an inspiration for CinemaCredo.com, my new podcast where I’ll be talking to people about the film that had the greatest religious significance to them, however they define religious significance. As for Untitled, while the first single (above) is a beautifully killer track, it’s the opener of the EP. “Bethlehem, WV”, that really hit me the hardest, perhaps because of the times I’ve yelled at God myself just over the border in Virginia. Epiphanies come in the most surprising places. So I pre-ordered the vinyl release of Dirty Computer, certifiably the best album I bought this year because it’s the best album released this year period. Just fantastic. Anyway, so I preordered it through the label, Warner, in June and they immediately put a pending charge on my card. That’s not a problem. Honestly, I’d be fine just paying up front for a pre-order. Anyway, the charge fell off the next day. Then it showed up the next week. And gone again. Every week until mid September, two weeks before the album was scheduled to come out. I got an email explaining that Warner was “required by law” to attempt to charge me every week, and that the charge had been rejected that week, and therefore my pre-order was cancelled forever. Anyway, I bought it from my favorite local record shop, Spoonful, like I always should have. Let that be a lesson to you. Freedom to a young rich man in the ruling class means something different than freedom to other people. Characters in Whit Stillman’s Metropolitan talk a lot about 18th century utopias, an ideal of freedom to their class forefathers, where men could practice free love and women were free to commit suicide. Alright, the plans probably looked better on paper. Stillman indues his characters with a sense of nostalgia for a loss of power, but the power being lost is power no man should have. “So many things which were better in the past have been abandoned for supposed convenience,” one character laments. Of course he’s talking about removable collars. Stillman himself, isn’t exactly nostalgic for the same things his characters are. I hope. 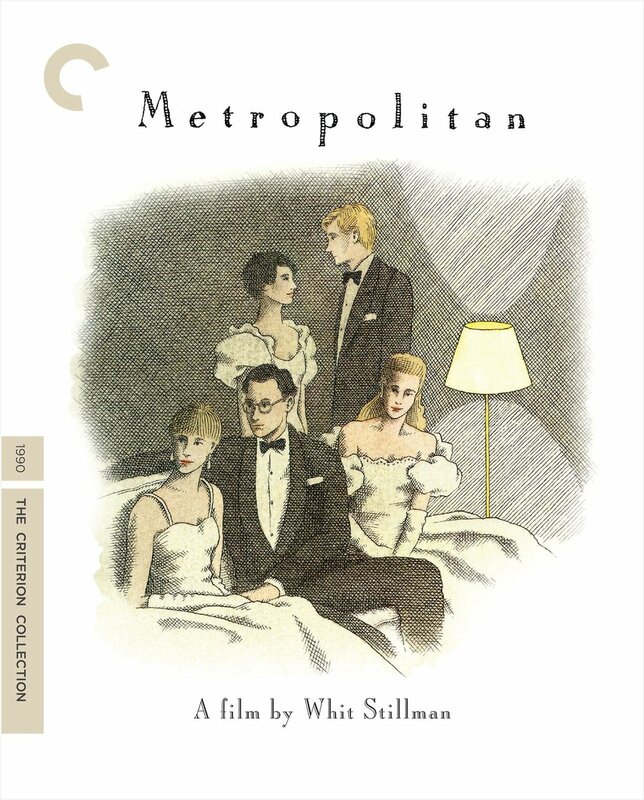 We talk about the not quite disappearing bourgeoisie with Whit Stillman’s Metropolitan. Listen via iTunes or LostInCriterion.com, and while you're at it, like us on Facebook or support us on Patreon. Throughout six years of watching Criterion films with Pat I've often thought about starting a sister podcast in with a much more overtly religious/philosophical tinge. Religious movies fascinate me, not only from main stream directors -- the works of Dreyer, Scorsese's religious work, things like mother! or First Reformed -- but also the often much less artistic films from more overtly religious sources, like, say, Kirk Cameron's Saving Christmas or God's Not Dead. I didn't want to make a bad movie podcast, though, nor one that only talked about prestige film as much of that would just rehash Lost in Criterion conversations. So I've settled on Cinema Credo, a podcast where I invite anyone willing to talk to me about the film with the deepest religious meaning to them, however it is that they interpret "religion" or "meaning"
For Episode 1 I’m talking to Christian monk Br. Thomas Stama about The Last Temptation of Christ, Long time Lost In Criterion listeners may recognize that I shared some of Tom’s incite in our own episode on that film in 2014. He’s an old friend, and I’m grateful to have him for this first episode. Since I'm letting my guests define the tone of the conversation, this may be the most explicitly Christian episode we'll have. Already on the recording docket are conversations on Groundhog Day, Death to Smoochy, and the 2012 Will Ferrel/Zach Galifianakis political comedy The Campaign. It's going to be an interesting ride. Check out CInemaCredo.com or iTunes, Spotify, etc. for the continuing saga. I hope to put out episodes monthly.